PezCyclingNews has covered ErgVideo as one of our favorite indoor training products for several years (see our review of their latest software here). 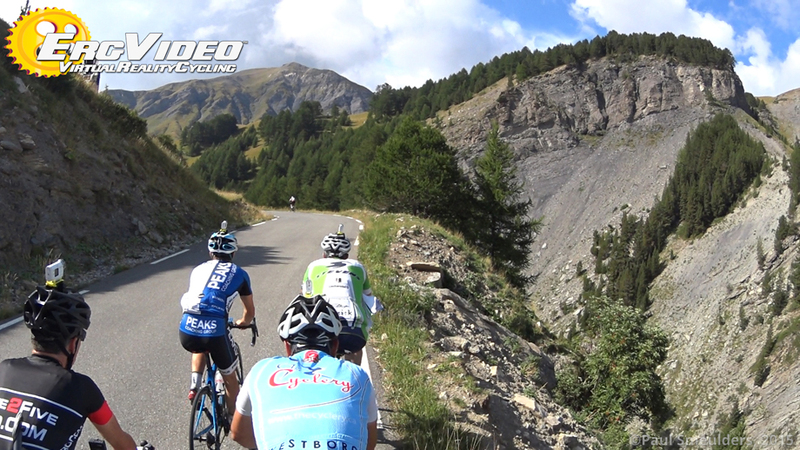 The ErgVideo team not only builds great training software, but they travel to famous cycling destinations with a whole team to create their unique content. 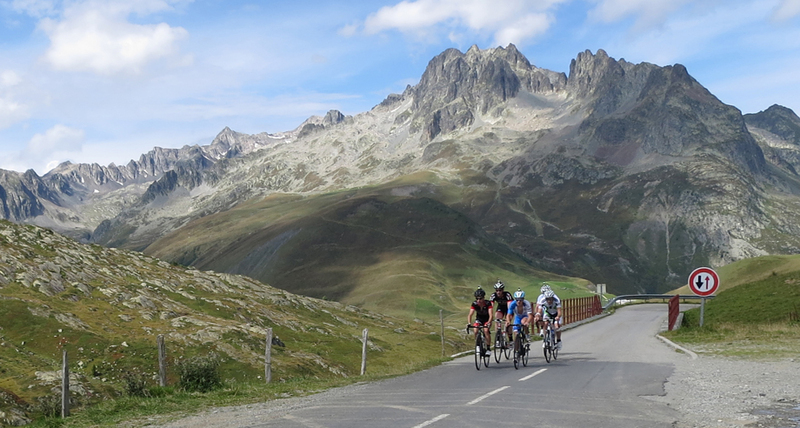 Here they share the story of their trip to some of cycling’s monumental climbs in the French Alps. It resulted in some of their best-ever ErgVideo editions. “Food?” - we’ll find some. It’s France after all. (duh). “Sunshine?” - guaranteed, unless it’s cloudy or raining. “Mountains?” - rumor has it. Have you heard of ‘the Alps’? “Lots of miles?” - you will be begging me for a rest day. And it’s kilometers. Royale with cheese, and all that. Nobody asks about the wine-list at dinnertime, masseurs, mechanics, or time off to see museums or go shopping. Asking gets you uninvited. Playing princess gets you dropped on the next climb. I call this kind of travel “bare-knuckles class”™ , and it’s my favorite. I hadn’t been back to the French Alps myself since 2006, nor the Alpe d’Huez area since ’98, so I called on my friends at Erickson Cycle Tours (the folks with PLENTY of that grace and aplomb I spoke about earlier) for a refresher on places to stay and how best to reach the mountains we need. “For the Alpe, Bourg d’Oisans is the right place if you can get enough rooms all in one place, you may be too late to book (it was already February), otherwise work your way out from there. The roads are busy until mid-September. Your second spot should be in the Barcelonette region because it’s far more relaxed, with access to more pastoral mountains, less trees, more wide open views, and quiet, narrow roads. We took you there in ’06, and you liked it”. Ah, indeed, and that would be a great spot, I agreed. The closest I could get to the Alpe at a “bare knuckles” price for 7 people was in a suburb of Grenoble called Echirolles. When Glenn Erickson found out he said “No problem, you MUST then take a day to ride on the plateau of the Vercors Massif, reachable from your hotel. Don’t ask questions, do it and thank me later”. He was right, and I did. It’s mind-bogglingly beautiful and will be featured in an upcoming ErgVideo edition. The gorges of the Vercors were an unexpected treat thanks to Glenn and Nancy Erickson. 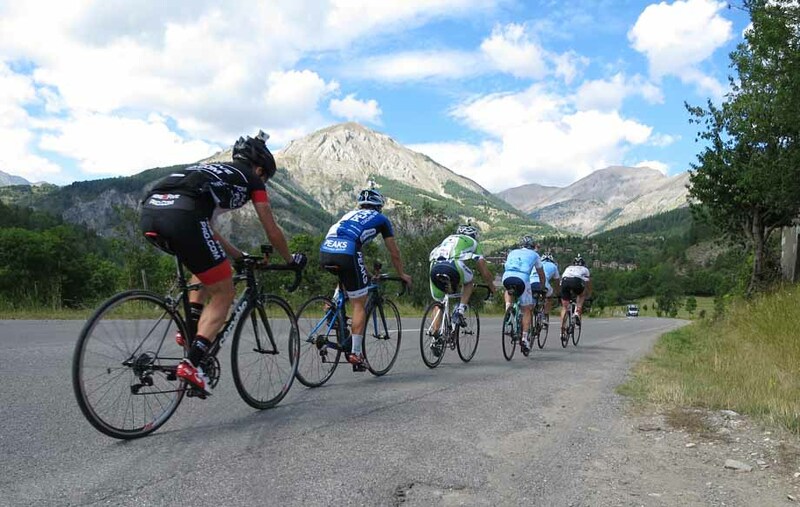 So in addition to the Vercors, staying in Echirolles means reaching Alpe d’Huez, Col de la Croix de Fer, Col du Glandon, and Col de Chamrousse, all of them Tour de France mainstays. 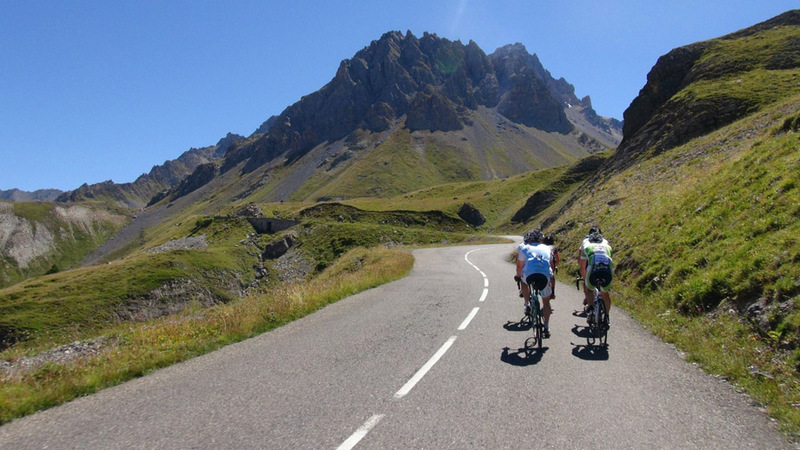 With a road trip, we could do Col du Telegraphe and continue on to the Col du Galibier & Lauteret. 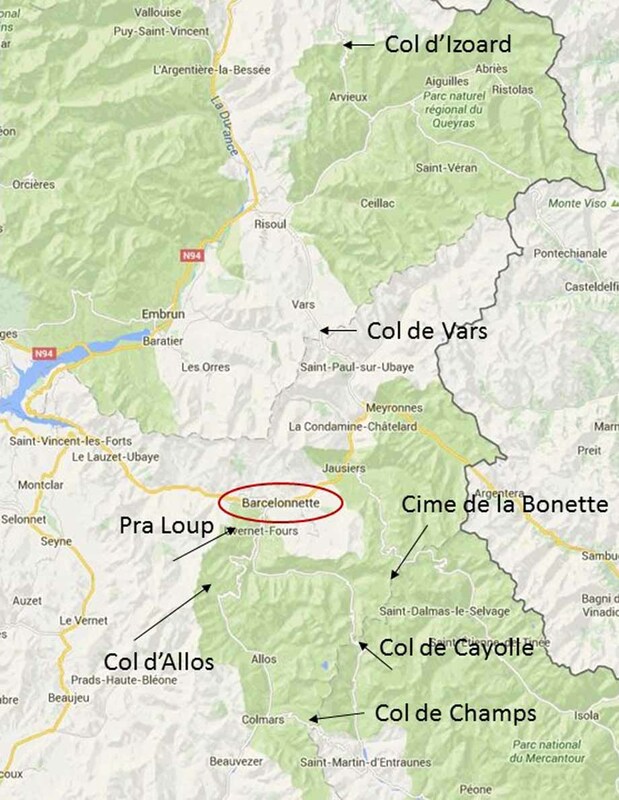 Our second base in Barcelonette would put the Col de la Bonette, Pra-Loup, the very cool loop of the Cols de Cayolle-Champs-Allos, as well as Col de Vars and the Col d’Izoard all within easy reach, and we could road-trip to some others if time and weather allowed. 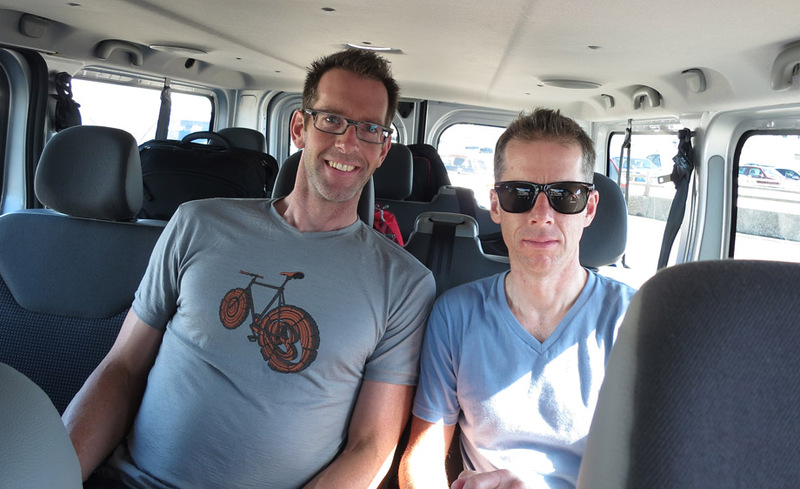 I say “road trip” because I like to keep the boys fresh for full efforts on the filmed climbs. If you were touring and like really long rides, you could ride to most of these mountains from the bases I’ve described. It’s pretty long but definitely do-able. 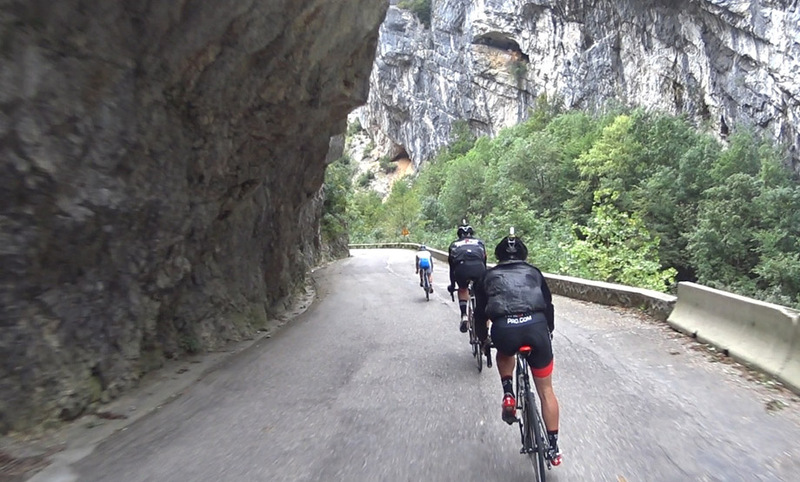 Gravel bikes in Barcelonette would be handy to explore a few more places where the roads turn dodgy. Although Barcelonette lacks the modern conveniences and more familiar American-style pub and bar scene of a big city like Grenoble, ultimately we liked it much better for its rustic small-village charm, easy to access small shops and bakeries, and every restaurant had an outdoor patio. It’s relaxed and fun. It was the French experience that I’d hoped to deliver to my team, despite the bare-knuckles designation. Barcelonette had everything that Grenoble lacked. 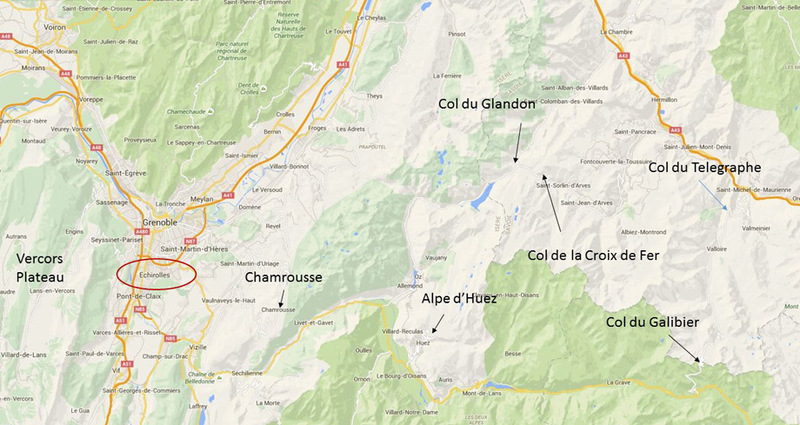 The planned rides from second base of Barcelonette. Vinny and Sean kindly agreed to arrive 2 days earlier than the rest of the team. 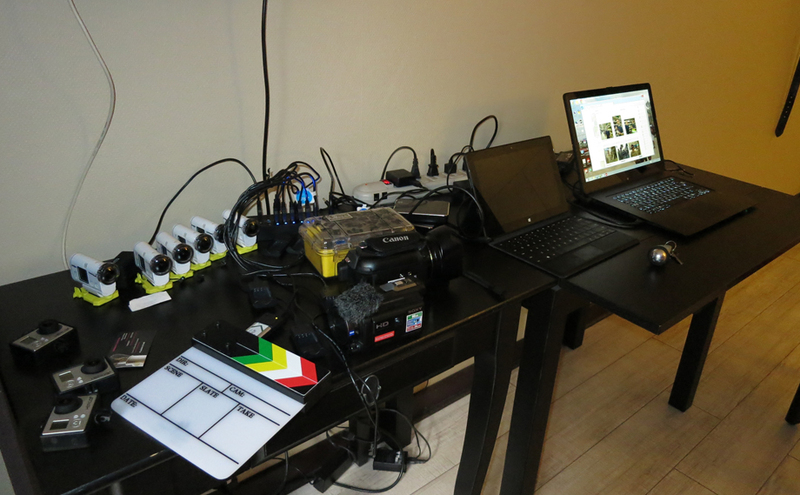 It’s handy to get them set-up on the rental car and myself on the van, as well as to do an initial scout of the hotel facilities and neighborhood before we have our hands full with more riders, the pressing tasks of filming, and all of “the unexpected” that I’m expecting. After landing in Lyon, it’s an easy auto-route drive to Grenoble, a city of 155,000 that feels much bigger. It’s just denser than the cities I’m accustomed to. Our hotel, while nothing special on the outside, was staffed by the typical folks who sincerely try to make your stay enjoyable. That attention transcends the actual surroundings or the (lack of) softness in the towels. 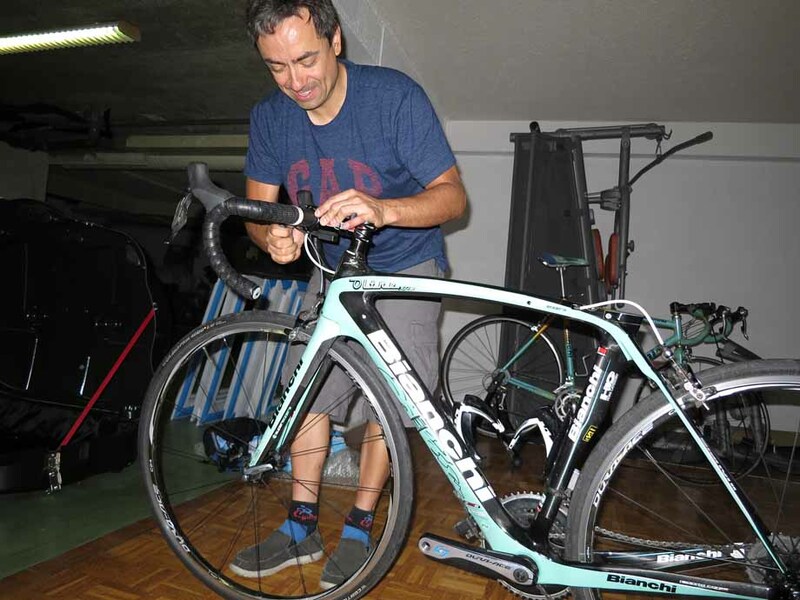 It’s common for them to have storage facilities for your bikes in a separate room, garage or basement. Unlike in North America where a few chain grease-infused bath towels have turned some hotels against bicycle-tourists, the French find a lovely middle-ground for everyone, allaying all concerns over damage or theft. They showed us a place to build our bikes, store our boxes, and store large pieces of the van interior we knew we wouldn’t be needing. Our hotel had a great place to setup and store bikes. Vince tuning his cockpit. We always draw the hotel staff’s curiosity when they notice the cameras bristling from the van, bikes and helmets, or when the maid reports that my room now looks like spy-central with computers, hard drives, batteries, chargers, beer and some more serious liquor to keep me unclenched and friendly. I’ve little doubt that more than one housekeeper has called the boss to have a once-over look in my room and consider holding my passport a little longer. When we tell them the purpose of our trip, they become even more helpful and eager to please. They’ll freely give info on where to go, and more importantly when to avoid traffic. It’s part of my bag of tricks to always engage the staff by telling them what’s up, and show a demo if they’re game. We befriend the waiting staff in the restaurant too. It draws out the best in them, and they seem happiest when they know they’ve helped you even more. Whether France, Italy or Spain, we get incredible co-operation from locals wherever we go, and we get invited back, too. Creepy-man central in room 22. On the day before the team arrived, Vince and Sean wanted to ride. 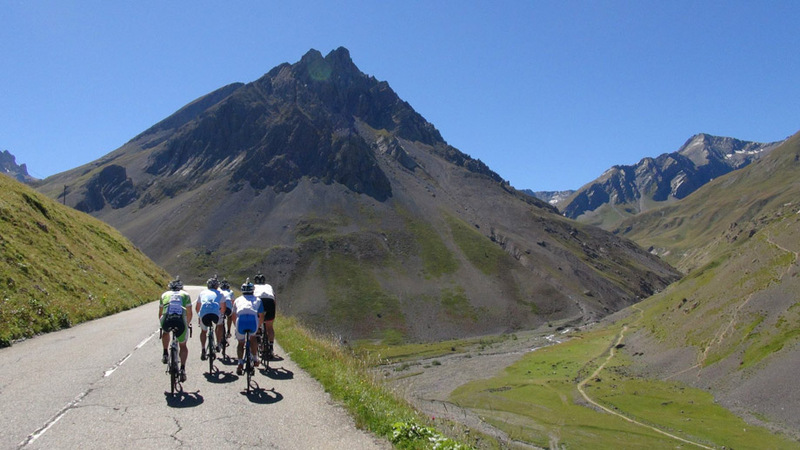 And what else but Alpe d’Huez? I mean, why not? No sense dipping your toes-in first or anything, just jump. 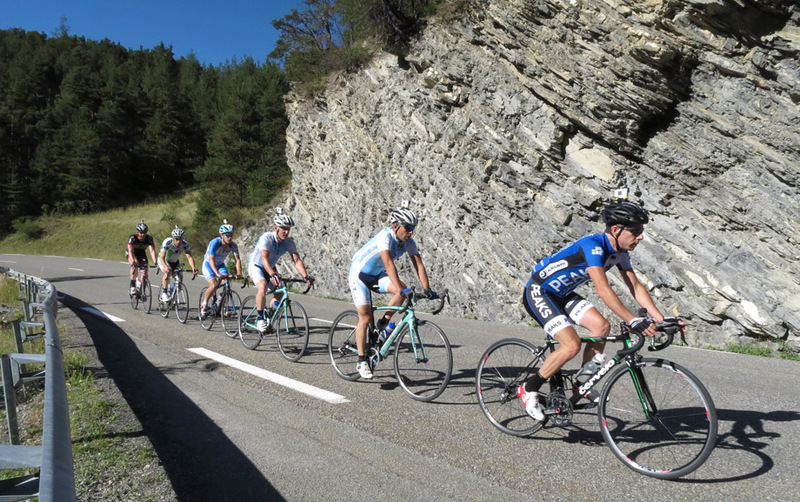 Rather than a long ride to its base, we decide to take the van to get closer first, so their day can be an easy warmup and then just the Alpe. You may think “that’s lazy!” but I’ll counter with “it was inspired!”, because the D1091 out of Grenoble is far from a pleasant ride. It’s busy, and while cars give you plenty of room, they’re so frequent that it’s noisy, tight, and makes you long for the quiet empty roads that seem to be everywhere else but here. It’s also a false flat uphill for a good distance, too. I liberated the boys from the truck onto bikes when we found a great spot beyond the false flat. That spot served as a standard starting/meeting point for several of the week’s rides, so this scouting was valuable. Someone should build a hotel there. Before: Legs Fresh and ready at the bottom of the Alpe. Low Tempo? There was no low tempo. We arrived at the airport to greet the new riders and saw a ton of gauze bandages on one and another moving with a curious and troubling stiffness. His partly-dressed wounds were sticking to his clothing. Indeed, a crash the day before in our local criterium series nearly tanked plans for this trip, with 2 of these four hitting the pavement. All four were in the same chase group when some wheels touched: we could have lost them all. They’d had a pretty uncomfortable economy-class plane ride trying to avoid being touched by others. Wait till you feel “bare-knuckles class”, gents. Welcome to France, ErgVideo-style. Warren’s first time in Europe. Andrew’s lost count. Stephen built his bike while Marc blogged about it. Basically the daily ErgVideo shooting grind goes like this: We get up, eat a ton, and have a briefing on where we’re going, how the shoot will be sequenced and what each rider is expected to do. I have to anticipate what kinds or “flavors” of training sessions we want, and I have to anticipate the things I can and can’t do in post-production. Getting all the footage that I need in “one take” is paramount. 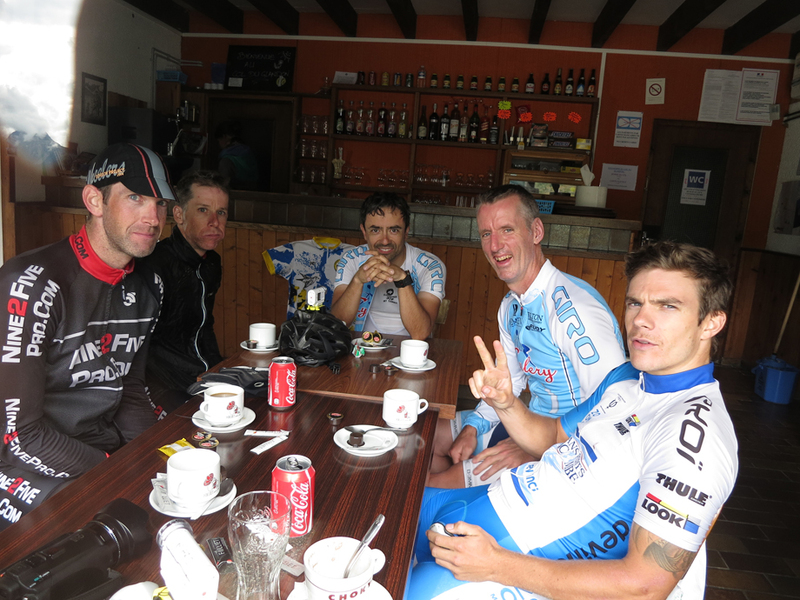 People get too tired riding up mountains all day, so to ask them to do it twice is a tall order that I avoid making. We run a minimum of 10 cameras on each ride. Not only do we get plenty of viewpoints to add variety to our productions, the redundancy also minimizes impact of failures such as poorly aimed units (or ones that shift from their initial aim because a rider adjusts his helmet), bugs squishing on lenses, batteries failing, and memory sticks spontaneously corrupting. Thankfully today the equipment is far superior than in the past, and I’ve chosen better and better tech as time goes on. After breakfast and briefing, the boys would load the van with lunch, tubes, drinks, tools, clothes and anything else we need. I managed the A-V systems, batteries etc. 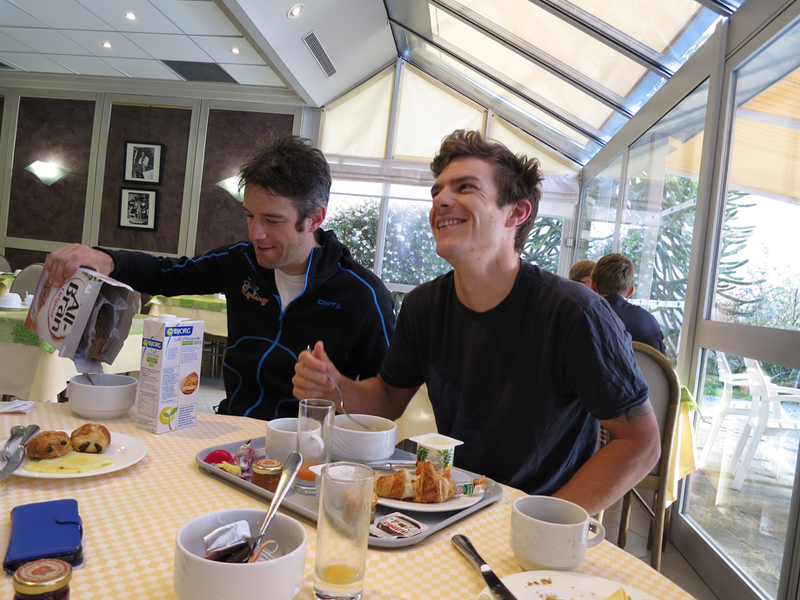 Marc would load each rider’s GPS devices with the day’s route, he’d check the weather for us, and was on hand as translator too, if the wait-staff-now-acting-as-local-consultants had something to add. Breakfast briefing is a high point for its anticipation of day ahead, except for Vince, who is not a morning person. Marc and Stephen are. Alpe d’Huez primary power profile, showing some aggressive action after the flatland warm-up. 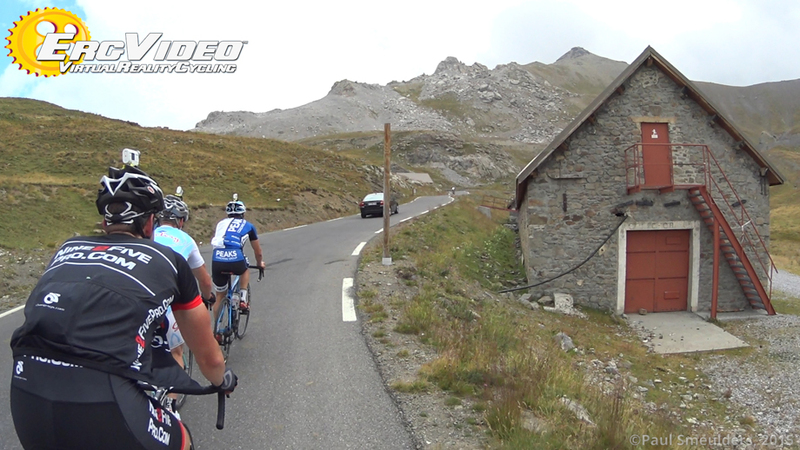 For some other editions, we wanted fairly tightly-bound group rides with less random attacking, but progressively increasing power throughout the climb. It gets faster as riders are blown off through attrition. At the top, the remaining riders ramp up the power for an exciting, competitive and exhilarating finish. It’s also great practice to learn to not over-commit your effort too early on a long climb, but rather learn to progress effort and power as you get near the top. We leverage the primary power profile to create a number of “preconfigured sessions” for each ErgVideo. 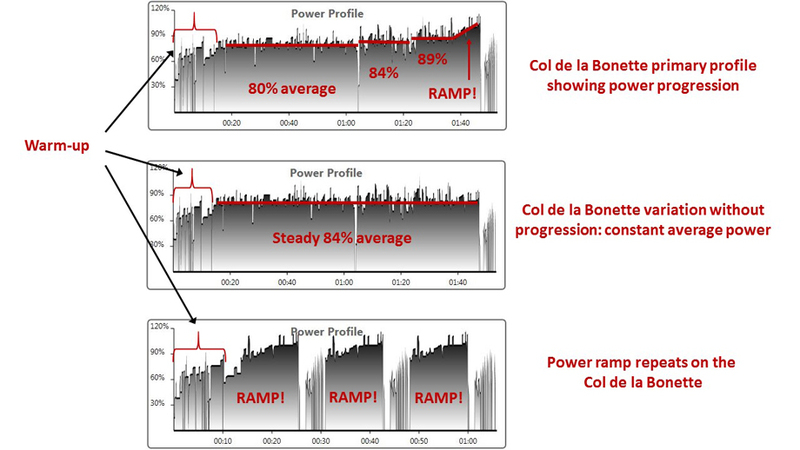 Below we show the primary power profile of the Col de la Bonette, highlighting the progression of average power, as well as the final ramping-push to the top. We also show how removing the progression results in a long climb at an extended constant average power: there are no discernible medium or long-term intensity changes. In the third frame, we show a session built from the final ramping interval repeated 3 times, with rest in between. It’s all provided for your training pleasure. Col de la Bonette power profile, some variations. Hey, I can tell you a new story about every day of the trip, from having to re-shoot the final 2.5km of the Croix de Fer, to evenings on the patio drinking far too much um, er, um, …oh, I forget what that stuff was, to learning new expletives from Andrew that now enrich my language daily. 1) Get some ErgVideos with which to train, and enjoy the challenges and scenery that we did while making our Alps editions. 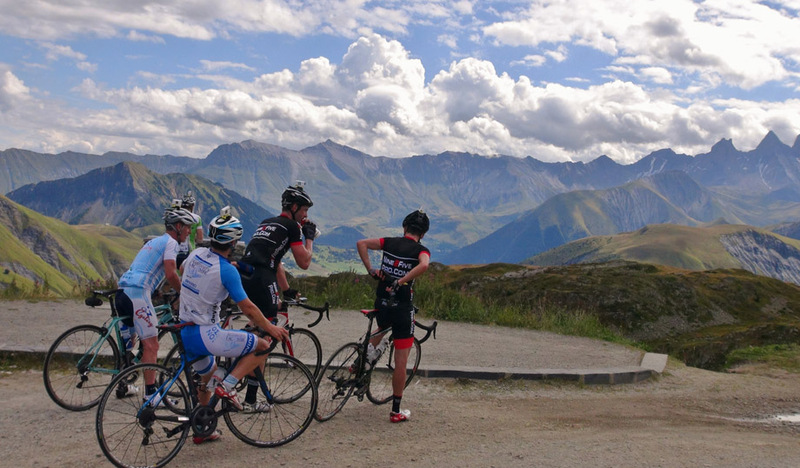 2) Go ride in the Alps, but be sure to look around. Stop and take photos when you want. Hanging desperately to wheels in a competitive pack is its own experience, no question, but it will also ensure you miss a lot. I mean, a LOT! The remainder of this article is a photo essay of highlights, with minimal commentary. Like a trip to the French Alps, just relax and enjoy. I have a few wrap-up comments at the end. 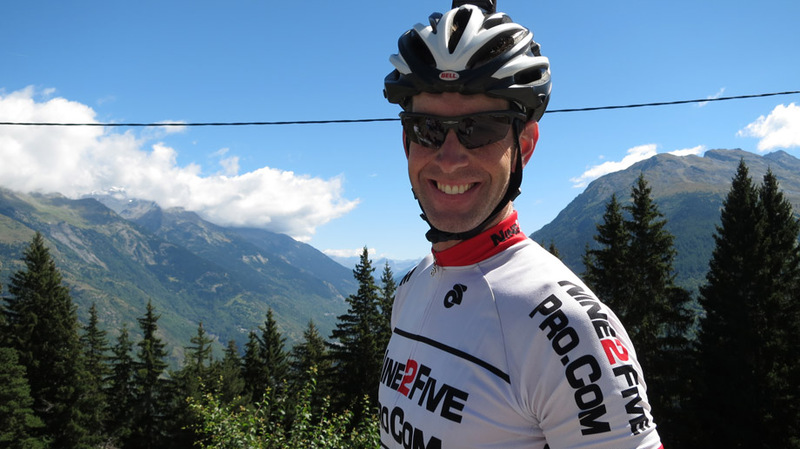 Smiles before miles: Heading out to the Col de la Croix de Fer. Be sure to look behind you from time to time. You won’t have a shutterbug like me along to capture it all for you, nor 10 video cameras rolling at all times, either. You’ll wonder what it’s like to drive halfway up a mountain after work every day. Village enroute to Croix de Fer. You’ll encounter other riders everywhere. This lad (video above) has caught the bug young, and he knows how it’s done: hang on to those who pass by. Watch as he tries to keep the ErgVideo team in range, then feel his pain when he cracks. 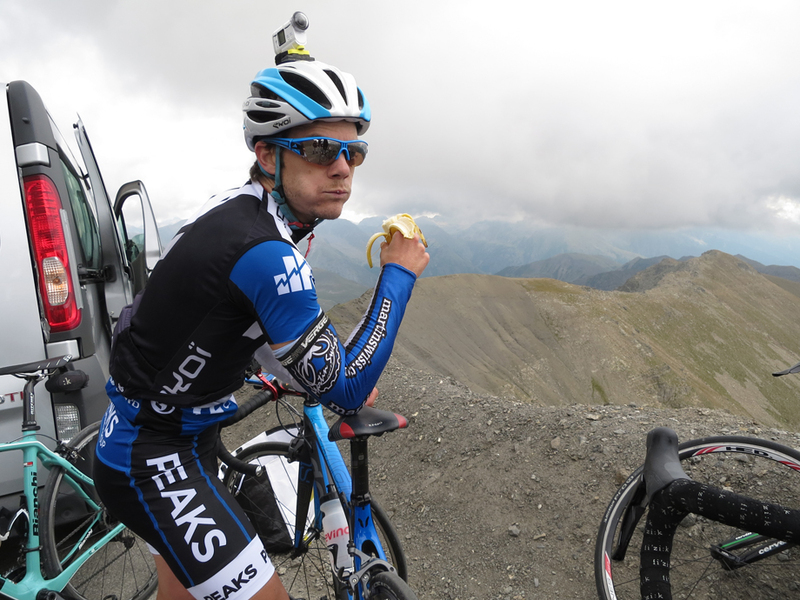 We liked this kid’s chutzpah so much we left it in the final cut of the Croix de Fer ErgVideo. Take time after your efforts to enjoy the cafes. …and pause to absorb all that beauty. Alpe d’Huez. Don’t be too shocked if clouds below you block the view to the valley. Alpe d’Huez is about the busiest place we encountered. On both of our rides, events both publicly and privately organized were passing through. It made following with the van pretty tricky, with cars lining up behind me too often for comfort. Our waiter at the Echirolles hotel gave us good advice to film it early on a Sunday morning. Less events, plenty of riders, fewer cars. Take pictures of those with whom you shared your trip. Ultimately, the rocks in the background are less important. 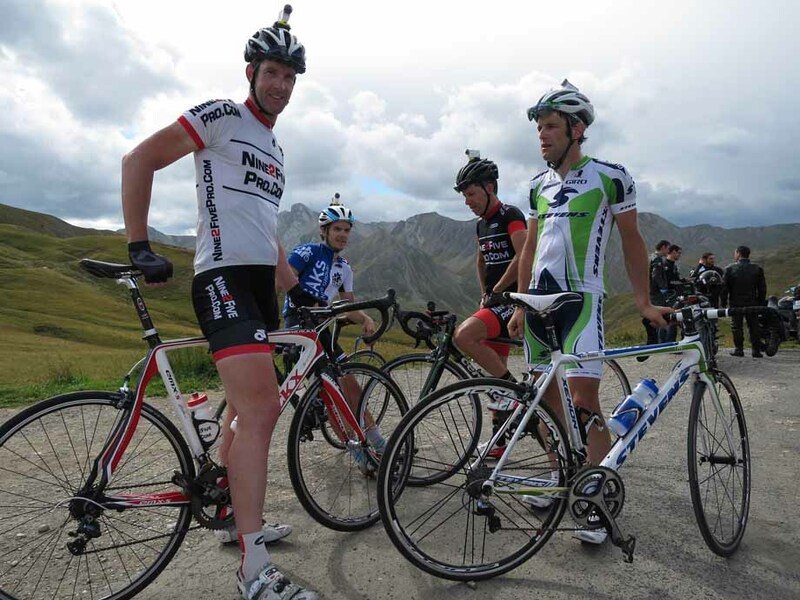 Warren seems happy to be at the Col du Telegraph. 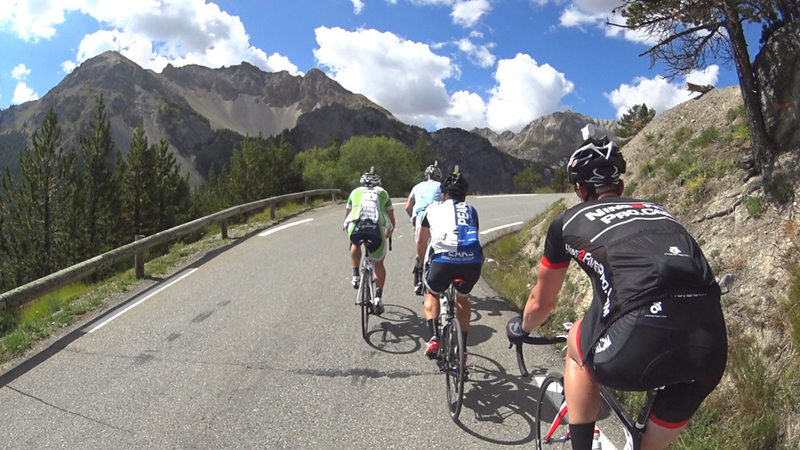 Really crisp blue skies on the day we shot Galibier and Telegraph. Service structures for roads and the pastures that abound on this route. Not a lot of people live up here. That camera? Is that camera in my face again, Smeulders? So, you see? Bare-knuckles class is where it’s at. Nobody looks unhappy, eh? Thanks for reading and looking. As we produce more editions from our Alps trip, we’ll be posting more sample videos and photos at our website and facebook page. Follow us at the ErgVideo facebook page to stay on top of new releases, new photos, and news. I’ll leave you with some preview clips of ErgVideos released so far from this adventure. More to come!